Constance Mable Covell, the daughter of Samuel B. Covell, was born on May 22, 1907 in Edgewood, Providence County, Rhode Island. Constance married Edson Woodbury Sawyer, son of George Frederick Sawyer and Naomi Woodbury Babson. Find A Grave Memorial# 65345646. Sixteenth Census of the United States, 1940, Washington, D.C.: National Archives and Records Administration, (1940) , Census Place: Salem, Essex, Massachusetts; Roll: T627_1589; Page: 4A; Enumeration District: 5-340. Find A Grave Memorial# 65345625. Harrison Colby, A genealogy of the descendants of Abraham Colby and Elizabeth Blaisdell, his wife, who settled in Bow in 1768, , at https://archive.org/details/genealogyofdesce00colb . Concord, N.H.: Printed by the Republican Press Association, (1895) Microfilm #896944 of the Family History Library, Salt Lake City, Utah, pp. 134-5. 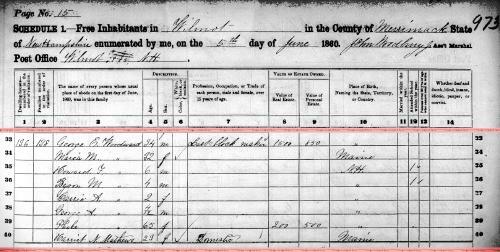 "United States Census, 1850," database with images, FamilySearch (https://familysearch.org/pal:/MM9.3.1/TH-267-11591-100691-69?cc=1401638 : 9 April 2016), Massachusetts > Middlesex > Cambridge > image 33 of 363; citing NARA microfilm publication M432 (Washington, D.C.: National Archives and Records Administration, n.d.). 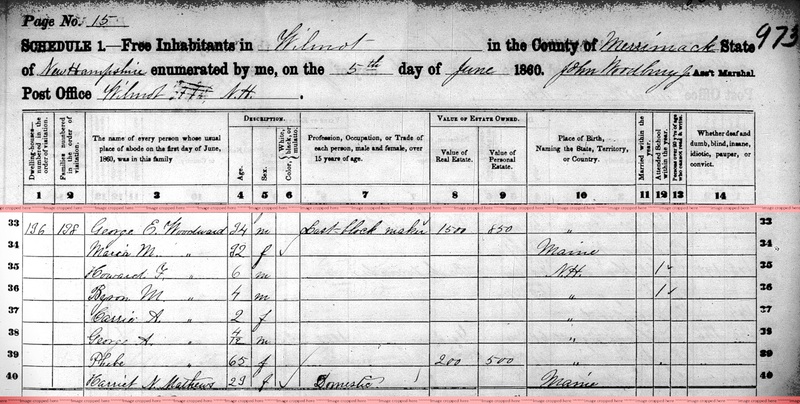 "United States Census, 1870," database with images, FamilySearch (https://familysearch.org/ark:/61903/1:1:M6DJ-HYK : 17 October 2014), Asa Crabtree, Maine, United States; citing p. 21, family 170, NARA microfilm publication M593 (Washington D.C.: National Archives and Records Administration, n.d.); FHL microfilm 552,044. Brookline (Mass. ), Vital Records of Brookline, Massachusetts, to the end of the year 1849., Salem, MA: The Essex Institute, (1929) , p. 172. Susannah Crandall was born perhaps about 1768. Donna, "Martha. Martha. Martha. ", PLYMOUTH BROCK, , at http://plymouthbrock.blogspot.com/2013/01/martha-martha-martha.html . Maine State Archives; Augusta, Maine, USA; Pre 1892 Delayed Returns; Roll #: 12. "Massachusetts, Town Clerk, Vital and Town Records, 1626-2001," database with images, FamilySearch (https://familysearch.org/ark:/61903/1:1:F4KW-TR8 : 13 July 2016), Julia Bliss Crane, 30 Sep 1855; citing Birth, Wilmington, Middlesex, Massachusetts, United States, , town clerk offices, Massachusetts; FHL microfilm 2,257,888. 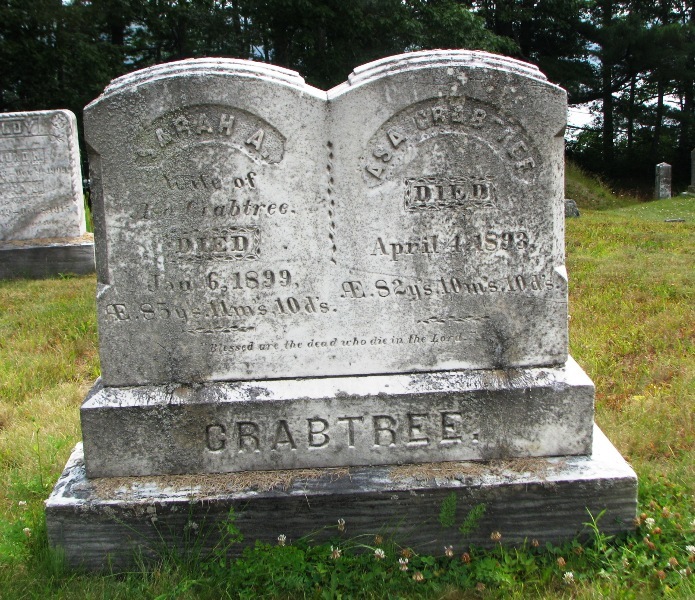 "New Hampshire Death Records, 1654-1947," database with images, FamilySearch (https://familysearch.org/ark:/61903/1:1:FSLV-KZ1 : 12 December 2014), Julia B Woodward, 23 May 1878; citing Wilmot, Bureau Vital Records and Health Statistics, Concord; FHL microfilm 1,001,116. "New Hampshire Marriage Records, 1637-1947," database with images, FamilySearch (https://familysearch.org/ark:/61903/3:1:S3HY-DCYQ-PX8?cc=1520640&wc=MJ78-168%3A1042688401 : 21 May 2014), > image 2854 of 4918; Bureau of Vital Records and Health Statistics, Concord. Harrison Colby, A genealogy of the descendants of Abraham Colby and Elizabeth Blaisdell, his wife, who settled in Bow in 1768, , at https://archive.org/details/genealogyofdesce00colb . Concord, N.H.: Printed by the Republican Press Association, (1895) Microfilm #896944 of the Family History Library, Salt Lake City, Utah, p. 129. 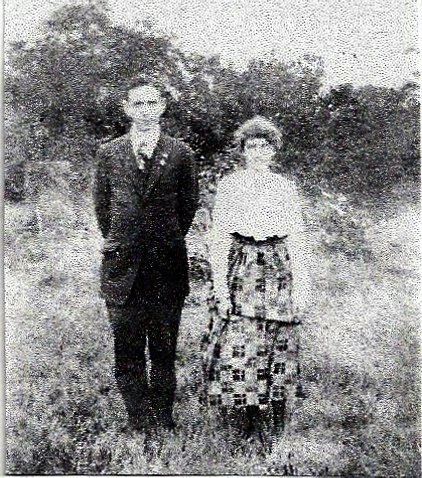 "Massachusetts State Vital Records, 1841-1920," database with images, FamilySearch (https://familysearch.org/ark:/61903/1:1:23YF-NCL : 4 December 2014), Percy Marling Hodge and Louisa Elizabeth Creesy, 25 Dec 1917; citing Marriage, Danvers, Essex, Massachusetts, United States, certificate number 309, page 478, State Archives, Boston. Find A Grave Memorial# 65643593. 1930 United States. Bureau of the Census. 15th census, United States, 1930 federal census : population schedules ; NARA microfilm publication T626, Washington, District of Columbia: Bureau of the Census Micro-Film Laboratory, ([19--?]) , "United States Census, 1930," database with images, FamilySearch (https://familysearch.org/pal:/MM9.3.1/TH-1951-22743-358-7?cc=1810731 : 8 December 2015), Massachusetts > Essex > Danvers > ED 28 > image 28 of 34; citing NARA microfilm publication T626 (Washington D.C.: National Archives and Records Administration, 2002). "United States Census, 1940," database with images, FamilySearch (https://familysearch.org/pal:/MM9.3.1/TH-1971-27876-2404-94?cc=2000219 : 11 July 2014), Massachusetts > Essex > Danvers Town > 5-58 Danvers Town bounded by Boston & Maine Railroad; Town Line; Boston & Maine Railroad, Putnam's Pond, Sylvan; also Danversport-Danvers (part) > image 28 of 38; citing NARA digital publication T627 (Washington, D.C.: National Archives and Records Administration, 2012). Find A Grave Memorial# 65643290. (?) Crisp was born perhaps about 1787. Harriet H. Robinson, "Nicholas Browne of Reading and Some of His Descendants", The New England Historical and Genealogical Register Vol. 44 (1890): pp. 284-5.
living at 122 Shawmut St., Chelsea, Massachusetts. Town and City Clerks of Massachusetts, Massachusetts Vital and Town Records, Provo, UT: Holbrook Research Institute (Jay and Delene Holbrook), , Boston > Marriages, 1841-1844 > 228. 1900 United States. Census Office. 12th census, 1900 population census schedules, Washington, District of Columbia: Bureau of the Census Micro-Film Laboratory, ([197-]) , Census Place: Chelsea Ward 3, Suffolk, Massachusetts; Roll: T623 689; Page: 3B; Enumeration District: 1561. 1880 United States. Census Office. 10th census, 1880 federal population census, Washington, District of Columbia: National Archives and Records Service, ([19--]) , Census Place: Chelsea, Suffolk, Massachusetts; Roll: T9_562; Family History Film: 1254562; Page: 390.2000; Enumeration District: 792; Image: 0302. Anthony Lee Crook was born on August 30, 2010. He is the son of Jacob E. Crook and Laura Claire Prince. James Savage, A Genealogical Dictionary or The first Settlers of New England showing Three Generations or Those who came Before May, 1692 on the Basis of Farmer's Register, (1862) , vol. 2, p. 229. Wife of Peter Gardner of Roxbury, Massachusetts The English Origin of Rebecca Crooke, The New England Historical & Genealogical Register, Vol. 159, Boston: New England Historic Genealogical Society, (2005) , pp. 40-2. 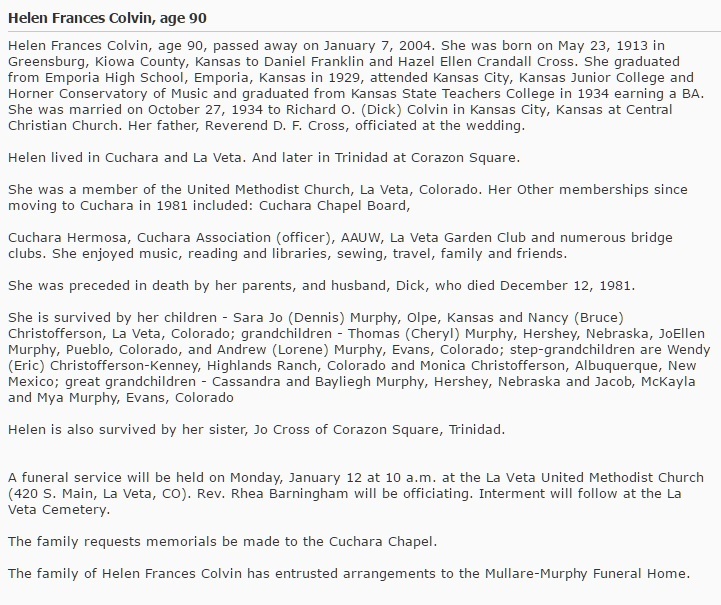 "New Hampshire Marriage Records, 1637-1947," database with images, FamilySearch (https://familysearch.org/ark:/61903/1:1:FLZM-3DF : 12 December 2014), Helmer Oscar Johnson and Ethyl Louise Crosby, 23 Oct 1937; citing Marlboro, , New Hampshire, Bureau of Vital Records and Health Statistics, Concord; FHL microfilm 2,069,377. "United States World War I Draft Registration Cards, 1917-1918," database with images, FamilySearch (https://familysearch.org/ark:/61903/1:1:KZND-4LT : 12 December 2014), Charles Albert Crosby, 1917-1918; citing East Brookfield City no 11, Massachusetts, United States, NARA microfilm publication M1509 (Washington D.C.: National Archives and Records Administration, n.d.); FHL microfilm 1,684,524. "United States Census, 1920," database with images, FamilySearch (https://familysearch.org/ark:/61903/1:1:MF9N-QDX : 14 December 2015), Chas A Crosby, Auburn, Worcester, Massachusetts, United States; citing sheet 15A, NARA microfilm publication T625 (Washington D.C.: National Archives and Records Administration, n.d.); FHL microfilm 1,820,744. Mrs. Sadie M. Sivert Taken By Death, Worcester Telegram & Gazette, Worcester, Mass., 1951. 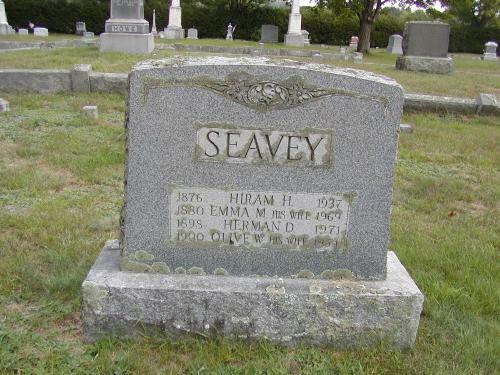 "New Hampshire Marriage Records, 1637-1947," database with images, FamilySearch (https://familysearch.org/ark:/61903/1:1:FLF4-MM5 : 12 December 2014), Hiram H. Seavey and Emma M. Crosby, 14 Oct 1898; citing Andover, Merrimack, New Hampshire, Bureau of Vital Records and Health Statistics, Concord; FHL microfilm 1,001,300. Record added: Aug 10, 2001. "New Hampshire Death Records, 1654-1947," database with images, FamilySearch (https://familysearch.org/ark:/61903/1:1:FSVP-35S : 12 December 2014), Seavey, 17 Jun 1902; citing Andover, Merrimack, New Hampshire, Bureau Vital Records and Health Statistics, Concord; FHL microfilm 2,130,450.
living at Cedar City, Callaway County, Missouri. 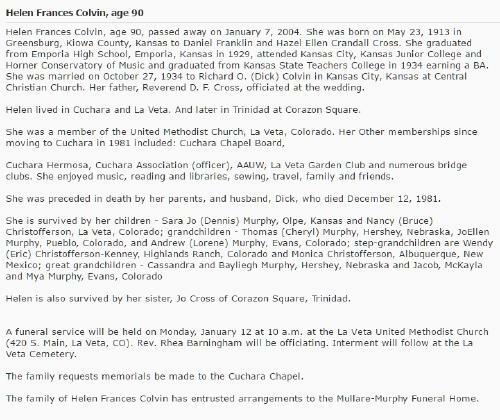 Colvin, Richard O (Helen) employed Katz Drug Co (Kansas City, Mo.) house 2102 Broadview Ave. The Emporia Gazette, Emporia, Kansas: , Date: January 16, 2004. Sixteenth Census of the United States, 1940, Washington, D.C.: National Archives and Records Administration, (1940) , Census Place: Cedar, Callaway, Missouri; Roll: T627_2092; Page: 7B; Enumeration District: 14-16. 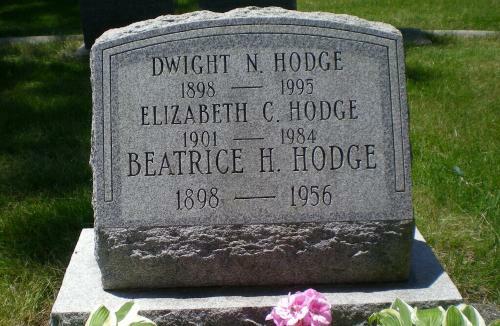 Find A Grave Memorial# 58883500. 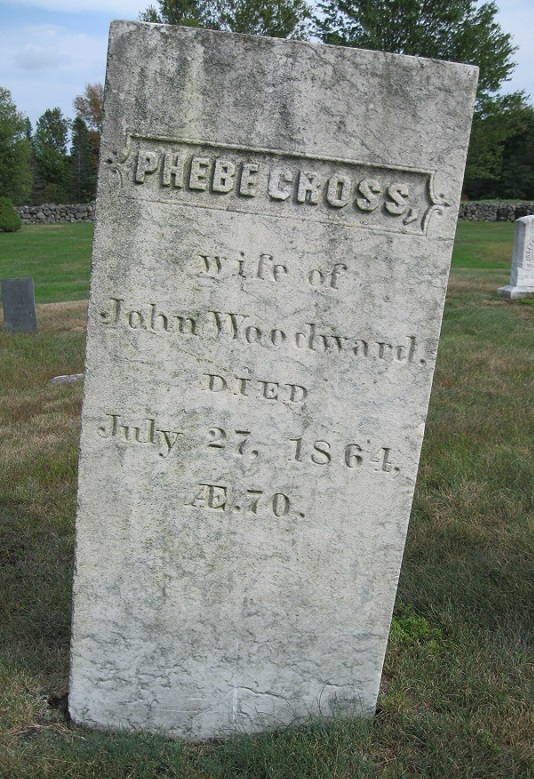 "New Hampshire Death Records, 1654-1947," database with images, FamilySearch (https://familysearch.org/ark:/61903/1:1:FSLV-29M : accessed 15 February 2016), Phebe Woodward Woodward, 27 Jul 1864; citing Wilmot, Bureau Vital Records and Health Statistics, Concord; FHL microfilm 1,001,116. Casper L. Le Varn, The early history of Wilmot, New Hampshire, , at https://books.google.com/books?id=HmojAQAAMAAJ . (1957) , p. 160. 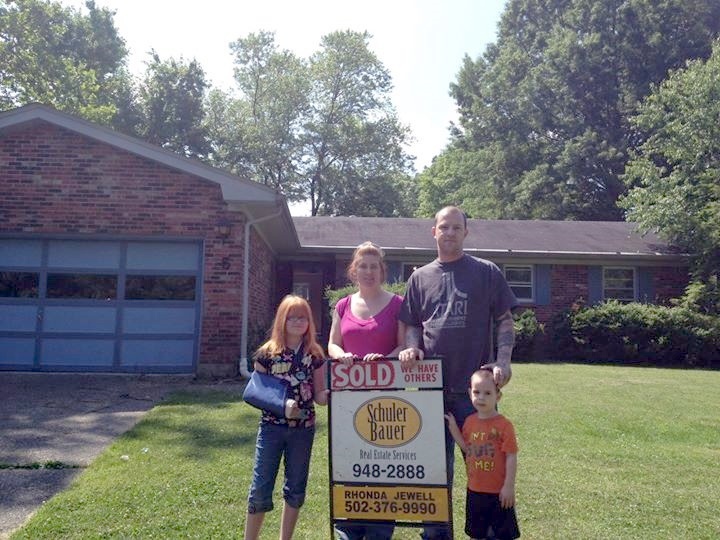 Find A Grave Memorial# 125108373. John D. Austin, Mayflower Families Through Five Generations, General Society of Mayflower Descendants, (1992) , volume sixteen, Part 3.